A family secret lurks in my work room, its edges smudged by family pride and shame and simmering disputes. Penciled thoughts leap from papers long forgotten; stamps and postmarks reveal clues that no one thought to hide. The secret’s outline is becoming sharper. Robert Minor was born in 1869, the youngest child of a well-to-do stock dealer in southwestern Pennsylvania. Francis Marion and Mary Jane Gwynn Minor passed on Greene County farms to each of their four children, with Robert inheriting the Home Farm, also known as the Jacob Myers farm. Like his family before him, Robert was to become a stock dealer, raising his two children, Helen and Donald, with his wife May Laura Stephenson Minor, on the Home Farm. What was on the land was far less valuable than what was IN the land, and once the coal rights were sold in the early 1900s, the family’s opportunities multiplied. Stories floated during our family reunions, whispers of fabulous wealth and travel, all lost to the depression and the world war that followed. The details remained in the shadows. I thought nothing of it, until I began collecting and curating family records. 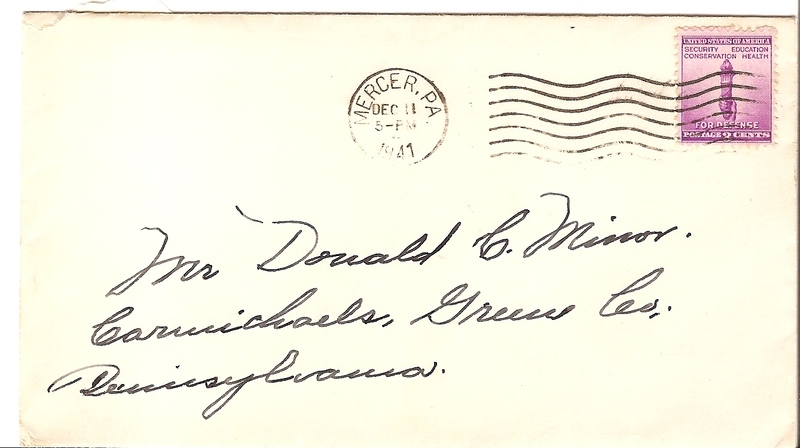 Four days after the bombing of Pearl Harbor, my great-grandfather wrote to his son, Donald Minor, from the Mercer Sanitarium, Mercer, Pennsylvania. The nurses were all working somewhere else and the “guests” receiving Dr. Richardson’s treatments needed to find new quarters. My mother was a young girl at that time, and vaguely recollects discussions surrounding her grandfather’s hospitalization. One fact stuck with her – Robert Minor ended up at Mayview, a psychiatric hospital outside Pittsburgh. 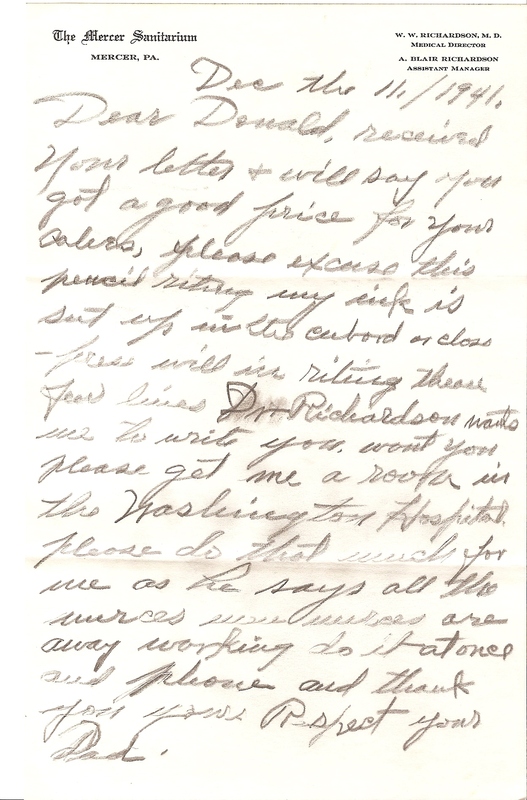 A cousin remembers stories of misery and desperation, with Robert pleading to be removed from the hospital. Did deteriorating wealth lead to deteriorating mental health? Were Robert and Donald estranged? What circumstances led to Robert’s stay in the sanitarium and from what was he recuperating? Was the Mercer Sanitarium more hotel than hospital, like the Victorian health resorts? If so, then a move to Mayview would have been a very jolting experience.